Did you know the town of Queensbury has its own ski mountain, West Mountain? And did you know that not only is it open in the winter for the skiing and snowboarding season, but it is open year-round as well? West Mountain is a great destination for locals and tourists alike as it is the only ski resort in the area! It is only half an hour from Saratoga Springs and 20 minutes from Lake George. It offers numerous recreational activities throughout the year, a full calendar of events, and a full service restaurant, The East Slope Bar & Eatery. Hit the slopes when the snow falls. 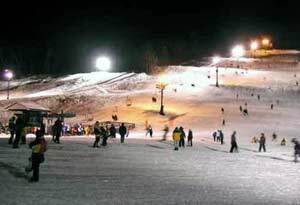 West Mountain offers 31 trails and even a snow tubing park! New to skiing? They also offer extensive snowboarding or downhill skiing lessons for all ages and abilities at the Snow Sports School. On the off-season, West Mountain offers mountain biking, hiking, volleyball, horseshoes, a campfire pit, Classic Car Cruise-Ins on Wednesday evenings, and more. There is something for everyone, at every age! When there is snow, skiing or boarding is an option every day at West Mountain at an affordable price! There are 31 trails for all abilities ranging from least difficult, moderately difficult, to expert. West Moutain is only one of only five ski resorts in New York state that offers snow tubing, so why not take advantage of this while you are in Queensbury? The Tubing Park is located right on the mountain, offering 5 tubing chutes at 700' and 1000' and two lifts to get you to the top! This is guaranteed winter fun for everyone! it's thrill to slide down the chutes! Extreme mountain biking is offered with lift and trail access or just trail access. Enjoy the beautiful views from the top of West Mountain! Hike up the mountain, or take the lift up and just hike down. West Mountain is 1470 feet in elevation at the top, 460 feet at the bottom, and offers 15 hiking trails. Come and practice your golf swing at beautiful West Mountain, where the golf driving range is open daily during the summer months. Volleyball, horseshoes, and a campfire pit are available at the base of the mountain. Coming from out of town? West Mountain offers ski and stay packages at a few hotels around Queensbury for your convenience!